The Channel Island of Sark only got full democracy a decade ago, has no cars or streetlights – and by the end of the week might have no electricity either. About 500 people live on the island and have been warned to expect a “bit of a wartime mentality” when the island’s electricity provider withdraws its services on Friday. The island – named the world’s first dark sky island in 2011 due to its lack of light pollution – is possibly going to get even darker. Why is the power being switched off? Sark has only had an island-wide electricity supply since the 1940s and it has always been viewed there as an expensive commodity. Islanders have grown up switching off lights in empty rooms and only boiling the amount of water they need in a kettle. They currently pay the island’s supplier – Sark Electricity Limited (SEL) – 66p/kWh compared to the UK average tariff of about 14p/kWh. However, an independent commissioner has ruled islanders are paying too much and ordered SEL to lower its tariff to 52p/kWh. SEL imports diesel by ferry and said high oil prices meant it would lose £20,000 a month at the new price. Manager David Gordon-Brown, whose family has run the firm since the 1960s, said he had “no option” but to pull the plug at the end of November. How are islanders preparing for it? There was some concern all the residents might be forced to evacuate, but that looks unlikely to happen now. However, islanders have been stockpiling water, candles, matches and firelighters. Nicky Baker, from The Food Stop – one of the island’s two general stores – said they had hired a generator which they hoped would see them through the blackout. “Our doors are electric, our tills are electric – and of course we’ve got our chillers and cold room,” she said. She said the shop had offered to look after people’s frozen foods. What are the rules on building skyscrapers? A hotel has also offered rooms to vulnerable people in the island and the Sark Sanctuary Centre at the Methodist church will provide hot showers. The island also has three pubs and several gift shops. But islanders, used to carrying torches because of the lack of street lights, are “more prepared than most” to deal with an impending blackout, Ms Baker said. Most homes have open fires and the majority of residents have coal-fired AGAs or gas cookers, she added. Can the stand-off be resolved? The island’s parliament, the Chief Pleas, said it was considering buying the electricity company to resolve the issue. In the meantime it insists it has “fairly sophisticated” contingency plans – but has not elaborated on what they are. 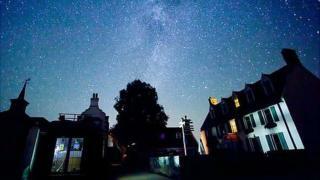 Guernsey’s government has offered assistance if Sark’s electricity is switched off. Although self-governing, Sark is closely tied to its larger neighbour, which legislates for the smaller island on certain matters. Discussions are scheduled to continue this week at Sark’s parliament to try to resolve the matter. And to complicate – or maybe speed things up – the island is due to hold a general election in a fortnight’s time.